CANBERRA, Australia — An Australian prime minister who a decade ago set an ambitious timetable for ending indigenous disadvantage has blamed a lack of government funding for slow progress. Kevin Rudd committed Australia to reducing the difference in life expectancies between Aboriginal and non-indigenous people on Feb. 13, 2008, when he made a historic apology to Australia's indigenous minority for past injustices. 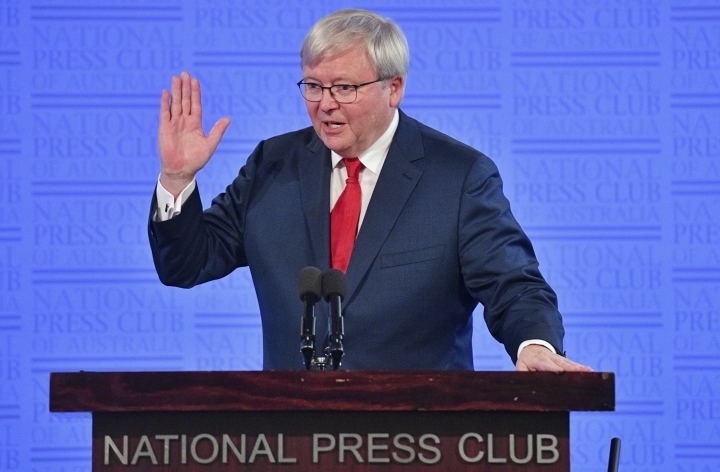 On the eve of the 10th anniversary of that apology, Rudd told the National Press Club of Australia on Monday that the conservative governments of Prime Minister Malcolm Turnbull and his predecessor Tony Abbott had failed to maintain funding for overcoming disadvantage and concealed cutbacks through a lack of transparency. Rudd led two center-left Labor Party administrations, mostly recently in 2013. "A major reason, although by no means the only one, we're languishing in meeting a number of targets is the uncertainty in government's financial effort over recent years and this needs to be named for what it is, rather than being buried in an increasingly indecipherable lump of statistical mud," Rudd said. The government on Monday released its 10th annual Closing the Gap report which measures progress in overcoming disadvantage in seven areas, the most important being a decade difference in the life expectancy between the races. Australia was on track to meet only three of those targets — halving the gap in child mortality by 2018, halving the difference in students completing high school by 2020 and enrolling 95 percent of indigenous 4-year-olds in education programs by 2015. Rudd described the latest report as a "mixed picture." "I can only conclude that a major reason we are starting significantly to fall short of the Closing the Gap targets is because this ... government has withdrawn funding effort," Rudd said. Turnbull has denied cutting indigenous spending and criticized Rudd for setting targets and timeframes without consulting indigenous leaders. The government was consulting with Aboriginal groups as equal partners to set new targets for each state by October, Turnbull said. The latest report was the first since 2011 in which at least three measures were on track to achieve Rudd's targets. Last year, only the target to increase indigenous students finishing high school was on schedule. Rudd made no apologies for his lack of consultation in setting his targets. "These targets were meant to be ambitious, they were meant to challenge us all because we had to shake ourselves out of our national torpor, that business as usual was fine," Rudd said.